Pauline Landes married the Rev. George C. Browne, a graduate of the Princeton Seminary, in 1940. 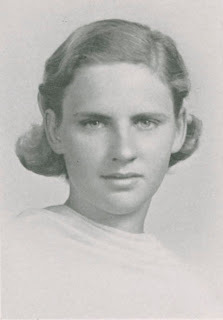 Alumnae Quarterly (AQ) May 1944: "Pauline Landes Browne, with her husband and two children are now living in California. They are under appointment as missionaries to China and are studying at the California College in China, taking full time language work, preparing to go to China as soon as conditions will allow." AQ February 1948: "Would that it were possible to let you read, in their entirety, the two letters we have received from China. Both Pauline Landes Browne and Betsie Hopkins Crothers are enthusiastic about their new work. "Polly lives with her husband, Chalmers, and their three children at Tung Men Wai, Chenhsien, Hunan, China. Chalmers has organized three centers of distribution for the sorely-needed UNNRA supplies; the one in Chenhsien alone distributed food to over 2800 families. In addition to relief work the Brownes are engaged in hospital work and student activity. Polly had 'just had enough of a taste of the life out here, just learned enough to make me want to know a lot more'." AQ February 1950: "Still away from the Orient are Pauline Landes Browne and her family. They hope to be able to return to China early next year." AQ May 1951: "Polly Landes Browne has sent a most interesting letter from Brazil where she and Chalmers are starting an appointment of six or seven years." The Brownes spent many years as missionaries in Brazil and we will catch up with them again when we move on to South America. Their story was included in the book Every Road Leads Home by Jule Spach. The March 1998 issue of Presbyterian Today highlights Pauline's family which included three generations of missionary doctors. Her father, Dr. Archibald Fletcher founded a hospital in Taegu, Korea. Her brother Archibald, Jr., was a thoracic surgeon in Maraj, India, while his son, Dr. John Fletcher, was sent to the Good Shepherd Hospital in Zaire.